This season in the North has been cold with odd weather which has put some of the spring fishing behind schedule. If you are hoping to get out for some early spring fishing, consider making a trip to your local pier or docks where you might find some panfish while you wait to get out on the open water. X Zone Lures Crappie/ Panfish Series offers 8 different types of lures to attract this species. Let's look at the X Zone Lures Stinger and Baller and how they can be used to catch some panfish. For those angler's down South, a day out for crappie and panfish can yield some large fish that are both fun to catch and great to eat. Armed with your favorite ultralight or light action with 2-4 lb test line will make reeling in the panfish feel heavy. 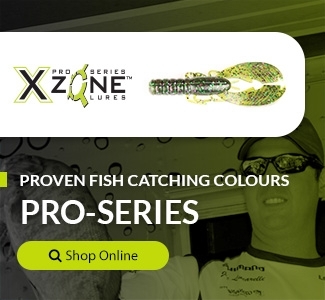 We recently caught up with a new addition to X Zone Pro Staff, Shawn McLaughlin and found that he has been out for some early spring fishing using X Zone Lures to catch some panfish while he awaits for the season to open on other species. As the ice melts, water temps rise in the backs of canals and bays... panfish everywhere start feeding more aggressively. There are 2 techniques that I use when targeting panfish, one would be a dropshot and the other a small jig and soft plastic under a slip or stationary float. One of the baits that have produced best for me this spring is The 2” Stinger by X Zone Lures. At times when the fish could be caught relatively close, the dropshot produced best. As for when the fish were out a bit further the Stinger rigged on a 1/32oz panfish series jig beneath a float was the ticket! The 1” Baller by X Zone Lures, is an excellent finesse bait when dealing with cooler water temps during spring and a less aggressive approach is needed. Because of its small profile, when using the Baller I prefer it rigged on a 1/32oz jighead under a light balsa float. I believe the profile of the bait imitates a larvae or nymph, and at times the panfish strictly feed on insects. Downsizing when water temps are less then ideal can produce amazing results. 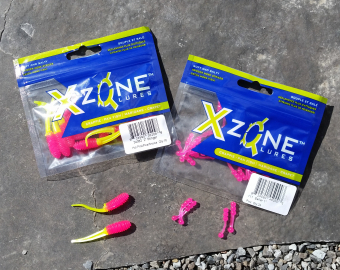 Give X Zone Lures panfish plastics a try this season and Get in the ZONE! You just can't beat the quality of hand poured lures as it is a softer bait, with better action and better overall quality. I prefer to through the Swammers rigged with a jig for fishing in the grasses and the vibrant colors attract the fish.